Miami Shores and Its Early Plant Life: What Were the Landscapes That Greeted the First Homesteaders in the Mid-1800’s? By Carol Hoffman-Guzman, PhD. It is a challenge to find good descriptions of the countryside in what is now Miami Shores—and in Miami in general. Most history books concentrate on the human settlements, the development of local towns, prominent figures, politics, and the difficulties that these newcomers had in adapting to the harsh climate and environment. The natural environment didn’t stir much interest except when it either hindered or helped the incoming settlers. When the first settlers arrived, the Everglades were as close to what is now Miami Shores as NW 22nd Avenue. The land in between was prairie that often flooded during the rainy season. Many of the homesteaders were poor white folks who came from states in the Deep South such as Georgia. Other settlers came from the Midwest (Ohio, Illinois etc.) or even from abroad (England, France). The homes were very simple, often one-story, usually built by the homesteader and his/her family, with recycled lumber, local pines, driftwood, or even wood from wrecked ships. Most houses initially had no electricity, running water, or gas. The settlers subsisted on family gardens, plants and animals from the environment, and occasional supplies from small stores in places such as Lemon City. Several books about the early homesteaders and residents give hints about the native plants. The book, Biscayne Country, 1870-1926, speaks about the early history of “Biscayne,” a large stretch of land that extended from Buena Vista north into today’s Little River, El Portal, greater Miami Shores, Biscayne Park, North Miami, and North Miami Beach. On the east and west, it stretched from Biscayne Bay, with its mangrove swamps, out west into where the Everglades once started, near present-day NW 22nd Ave. The author Thelma Peters, who grew up in Biscayne country, comments about the pine ridge where her father built a home and how beyond it stretched a wet prairie. The pine ridge was called the “Piney Woods,” and the wetland, “the Biscayne Prairie.” Thelma mentions the local pine trees, willows, and coontie plants that grew around her home. Next to the family home was the abandoned house of a brother of Julia Tuttle (the Mother of Miami). At 11 years of age, Thelma snuck over to peak into this house and mentions that her socks got covered with sandspurs and Spanish needle hug-tights—two low-lying native plants. 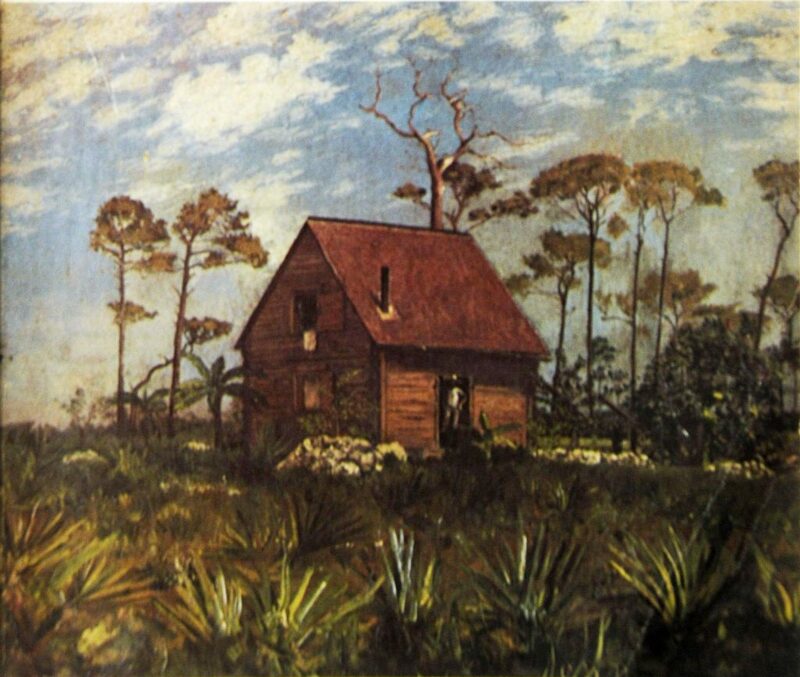 George W. Potter’s oil painting of the Potter homestead at Biscayne. The house was likely made in part from the native slash pines that once dominated the landscape. This illustration is on the cover of Thelma Peter’s book. The Douthit home was located in what is now called Little River. It is difficult to tell what the plants are in the foreground, but native slash pines are clearly visible in the background. 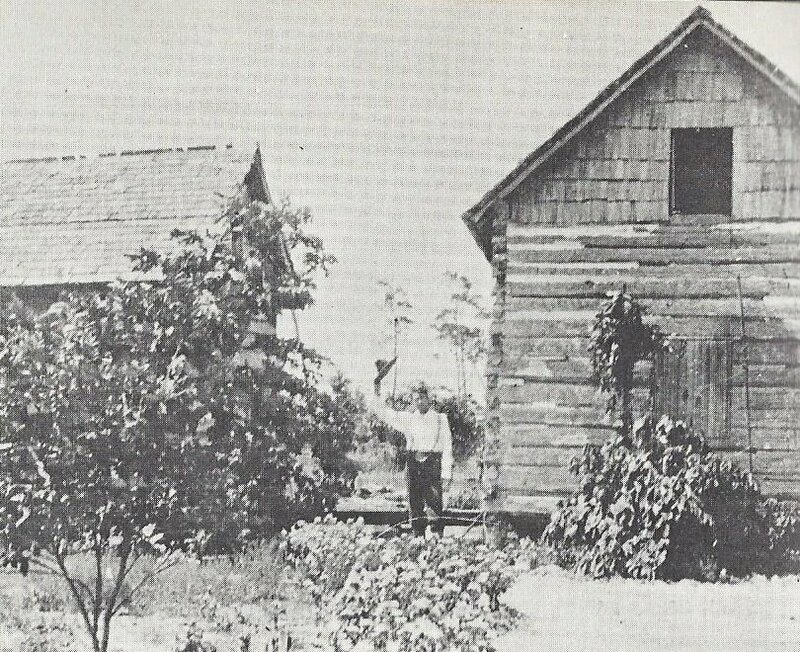 In a history of the Miami Shores Community Church, the book opens with a simple sentence, “Like other homestead sites for acres around, it was flat, sandy, crowded with palmetto scrub and tall pines.” The year was 1896, and the site was the homestead belonging to William and Mary Brooks. Grandma Brooks was determined that, until a “regular” church was built, her front parlor would have to do. So every Sunday, neighboring homesteaders made their way over rough, sandy trail-like roads to Sunday services at the Brooks’ homestead (located between today’s N. Miami Ave. and NE 1st Ave., and between NE 95 St. and 98 St.). In the above quote, one can pick out some hints about the landscape – flat, sandy, palmetto scrub, and tall pines. The book also mentions that the Brooks’ property was later bought out by Biscayne Fruit Company in 1905. The company cut down the palmetto scrub and the pines (which were South Florida slash pines). On the site they built both a sawmill and a starch factory. The starch was made from the Coontie root, which locally “grew in profusion.” The fruit company also put in long rows of pineapples, a fruit that loved the sandy soil. Voilá—the landscape had already begun to change. 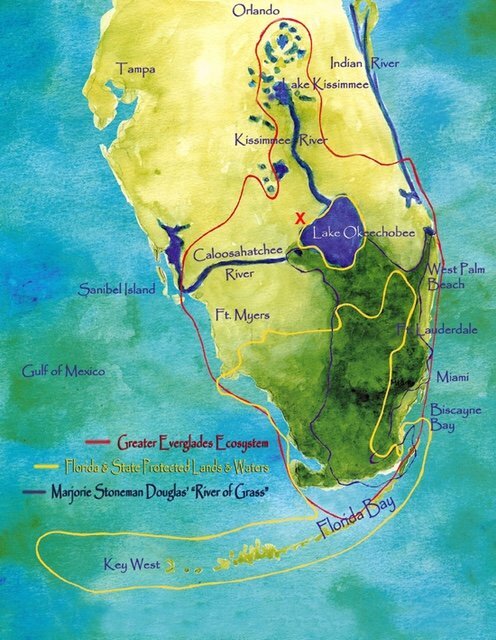 This illustration clearly shows the natural flow of water that flowed and filtered through the Everglades, providing the aquifer that remains the source of our drinking water. Soon the pine rocklands and wet prairies no longer existed because farmers and settlers drained the wetlands, including the eastern edges of the Everglades, flattened the pine rocklands, and paved much of the area. In the early 1900’s, what is now 103rd Street was called Biscayne Road and NE 2nd Ave. was West Dixie Highway. Goodbye to those rough sandy trails and native plants and wildlife, and so long to the natural flow of water through the Everglades. The black-and-white photos of the early homes and properties are also informative about the environment. In a photo of Thelma Peters’ home, you can see pine trees in the background and scrub palmettos in the foreground. A photo of Julie Tuttle’s property in Biscayne shows similar plants—and nothing more. You might ask, “Wait a minute! What’s going on? Where are the stately royal palms, magnificent oak trees, delicate ferns, mangoes & avocado trees, orchids, tropical plants, and lush lawns of today’s Miami Shores?” Many of these trees and plants were part of a beautification dressing created by the Shoreland Company to market its expensive lots and new Mediterranean-style homes in Miami Shores. Later settlers added more plants and trees to this non-native setting. Most of Miami Shores began its life as a simple limestone ridge with coonties, pines and scrub palmettos, alongside a wet prairie with sawgrass and other native boggy plants. Today most of these native trees and plants have been cut down and plowed under, to create a more bucolic setting for elegant homes and buildings, and the wet prairies and swamplands have been drained, disrupting the natural flow of the Everglades, and endangering the aquifer that lies beneath. Although some residents prefer to maintain the aesthetics of the lush and tropical vision of the Shoreland Company, an increasing number of organizations, businesses and individuals recognize the importance of healing and restoring Miami Shores’ native habitats and the natural balance that prevailed in this area. You can join this effort by including some of the now-threatened and endangered native plants from the pine rocklands and wet prairie lands. You can find a list of plants that are native to the area encompassed in our 33138 zip code here. And Fairchild Garden’s Connect to Protect program gives guidance on maintaining curb appeal when planting pine rockland plants here. This guidance is useful to keep in mind for other native plantings as well. This, Too, Can Happen in Miami, by Gladys Beckwith Tyler, Parker Press (Coral Gables), 1956. Dr. Carol Hoffman-Guzman is a 30-year resident of Miami-Dade County, with a BA in anthropology from Cornell University and a PhD in sociology from FIU. She currently resides in Miami Shores, where she has started researching the local history and plant life. Carol’s interest lies in the common people who developed the area, as well as a community’s use and interaction with native and introduced plants from prehistoric to modern times. This article shows the tremendous transition from early pioneering times in the Shores, to today’s sophisticated residences and environment. She is also writing a book about the plants and people of the Lake Okeechobee area. Aspiring or published women writers can join Carol and friends every Tuesday at 10 am at the Miami Shores Community Church for her Women Writers’ Group. For more information you can contact her at carolmhoffman@bellsouth.net. 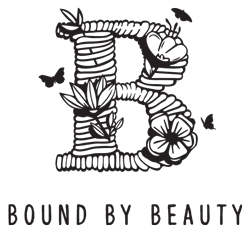 Stay tuned for Early Farming by Miami Shores residents, written by Carol Hoffman-Guzman for Bound by Beauty. During the summer rainy season, freshwater overflowed the south shore of Lake Okeechobee and flowed about 100 miles, dropping only about 12 to 14 feet in elevation, to reach its southern terminus in Florida Bay. Wouldn’t that be a wonderful sight to see. Thanks for reading.